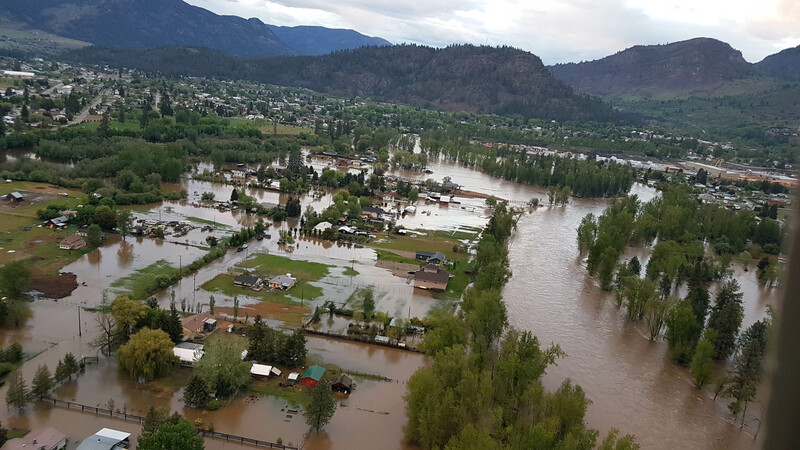 The Kettle River Watershed Authority has been heavily involved with the 2018 Flood Response. Click here to see all flood information on the RDKB website. Kettle River Q&A: What’s happening with the spring runoff? What’s happening with the spring runoff this year? If you are wondering about the snowpack levels and the river flows this spring you are not alone. Ever since the early high water of February and March, people have been asking about what was happening with the runoff this year, what will happen this summer with low flows, and whether this is already a sign of climate change affecting the watershed. This is a story that is still unfolding, but I will start at the beginning – the headwaters. The Kettle River has no glaciers or large reservoirs that regulate its flow, so we need to understand snow accumulation and the timing of its melt. The snowpack is a kind of reservoir that delivers water slowly over a period of months, providing meltwater for early summer river flows. Five automated high elevation ‘snow pillow’ stations in the area provide a stark view of the rapid melting that is at least three weeks earlier than the 30-year average. The stations provide the key measure of ‘snow water equivalent’ (SWE), which describes the depth of water in a given snowpack that you would find if you melted it instantly. 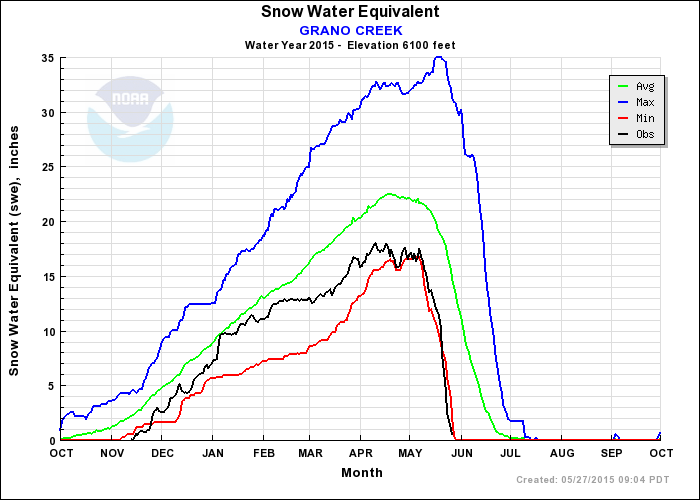 And the snowpack does seem to be melting almost instantly with the recent high temperatures and weekend rains. In the high mountains above the Christian Valley, the Grano Creek station now has 3% (just over 1 cm) of the long-term average SWE, and will have no snow any day. That’s the lowest on record – the earliest spring melt – since the station was installed in 1998. Near the headwaters of the Kettle River, the Barnes Creek station now has no snow, while the Mission Creek station is faring slightly better at 30% of normal. South of the border, the Sentinel Butte station east of Curlew and the new Gold Axe Camp station east of Chesaw both have no snow. You can find the latest data yourself at http://www.nwrfc.noaa.gov/snow/. So what does all this mean for flows in the Kettle River? It is probably bad news for river recreation this summer. Already, the warm, wet winter that was so hard on coastal and lower elevation ski resorts in this region gave us an early spring runoff in mid-February that was ten times normal and characteristic of mid-April. A second peak on April 1 was also ten times normal and similar to late-May flows. Now, the Kettle River is flowing at about 70% of normal volume for late May. With very little snowpack left, the river will likely continue declining for a long low period unless the early summer is cool and very wet. Unfortunately, the long-term forecast calls for warmer than average conditions across the region. On the positive side, it might be a good year for watermelons and other heat-loving crops. But the long growing season will mean greater evaporation from soil and water and much higher transpiration from plants, both leading to greater water demand from irrigation, outdoor water use, and forests. This prognosis has already caused a drought state of emergency in Washington State, and coastal British Columbia could face a very tough year for water supplies. Communities in the Southern Interior will have to take great care to monitor water supplies and control water use to soften the impact in our area. For many people, the low snowpack and warm summer on the way provides the even scarier possibility of major fires in the region. When the snow is gone early the branches, logs and organic matter that litter the forest floor can dry out that much quicker, which can mean a much longer and more dangerous fire season. Already, record warm and dry spring conditions in northern BC and the Yukon have led to large wildfires. Indeed, NASA has reported that the January-April period of this year was the hottest on record globally, following the record warm 2014. Over 97% of scientists who work in the field agree that adverse climate change is happening and that humans are responsible. There cannot be any more doubt that we must take decisive action to reduce carbon emissions and improve our resilience to the ‘un-natural’ disasters on the way. Graham Watt is the coordinator of the Kettle River Watershed Management Plan for the Regional District of Kootenay Boundary. Contact Graham at plan@kettleriver.ca or 250.442.4111. Warm weather over the last several days has brought the Granby and Kettle Rivers up to or higher than normal flows (see figures below). The BC Water Supply Bulletin for April 1 shows the Okanagan-Kettle region at 97% of normal and the West Kootenay region at 118% of normal, indicating an overall normal seasonal flood risk. By the end of April upper elevation snowpack in our region typically switches from accumulation to snow melt. Provincial snow pillows at Mission Creek (north of Big White), Grano Creek (east side of Christian Valley) and Barnes Creek (north of Granby Provincial Park in the Monashees) show upper elevation snow packs near or slightly above average. 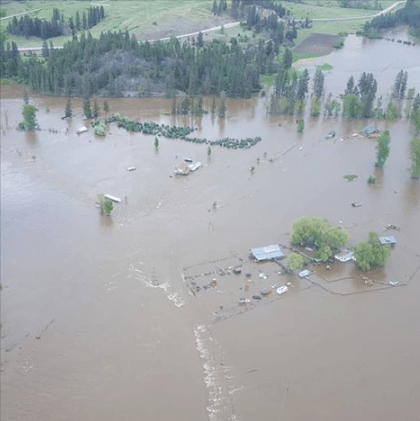 Flooding during spring freshet depends on snowpack but is highly sensitive to seasonal weather – as the Water Supply Bulletin notes, heavy precipitation or very warm weather can cause flooding in normal or below-normal snow packs. Above normal temperatures are highly likely for the period between April 19 and 26. The next Water Supply Bulletin will be released on May 8 based on April 1 snowpack data and regional forecasts. Current (solid) and long-term average (dashed) discharge (cubic metres per second) of the Granby River near Grand Forks.